Big occasions don't come around that often, and when they do, I like to be prepared with a big dessert. I'll be honest though that sometimes I create my own occasions as an excuse for baked goods. Did you just move out of your apartment? Perfect. A lot of my friends are turning 30 this year - perfect. Getting married is a huge occasion, one that you don't need to really need to make an excuse for and usually involves a year's worth of planning and plenty of excitement. Coincidentally, my blogging hiatus can be chalked up to my own wedding last weekend! My husband and I were legally married mid-March, but we wanted the party: the party that you can really only have when you invite 80 of your best friends and family to celebrate you as a couple. And we wanted to have it when the weather warmed up a little, which brought us to June 3 (and to this epic dessert). It is in my nature to geek out over translations (having studied translation in school), and translations of French baked good names are not only incredibly charming, they also help us understand what we are about to eat. The mille feuille is just that: a puff pastry of a thousand layers, or what seems like it. Kouign amann translates to cake butter (very accurate). Croquembouche, or croque-en-bouche, translates to crunches in the mouth. This depicts exactly what you're getting with this dessert. The caramel provides crunch and contrasts with the smooth pastry cream inside each cream puff: a heavenly combination that leads you wanting more. I like this recipe because you can make the components in stages. Make the pastry creams a day ahead. This gives the cream time to chill in the fridge and firm up until you're ready for it. If you don't want to make two types of pastry creams, don't! The choux buns are best eaten on the same day they are baked, so you'll need to give yourself enough time that day to bake about 75 of them (this sounds like a lot but it will only take an hour or two to make them all), fill them with the pastry creams, and assemble the tower. 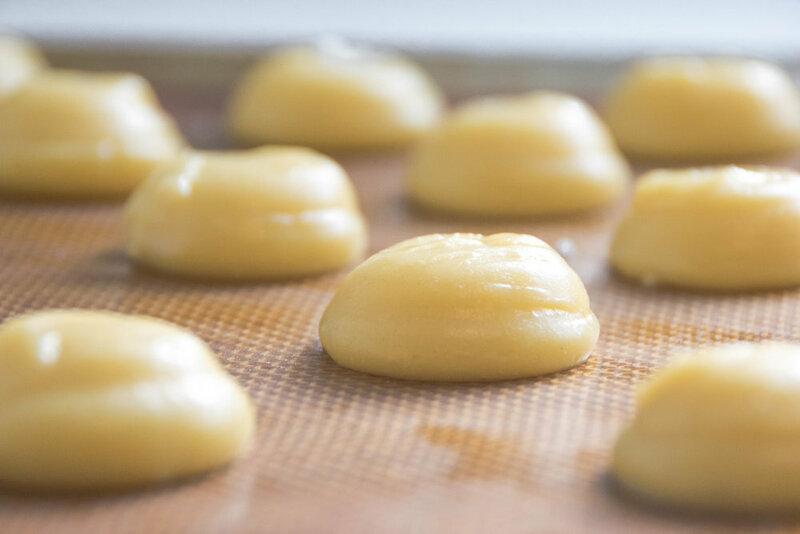 This whole process takes about three to four hours, and most of that time is waiting for the choux to bake and cool. You'll need to decide whether you want to construct this tower using structural support (like a cone-shaped bristol board) or attempting to build it free-hand. I've done the free-hand method three times, only because I seem to continually forget to buy something for structural support! There are lots of tutorials online on how to make a structure to build your tower around, like here and here. If you're looking for a showstopper, give this a try. It is somewhat challenging but well worth the effort. If you come out of this project without having burnt yourself with caramel and with a straight(-ish) tower, give yourself a pat on the back - that is an achievement (for the record, I burnt myself only once). If using a Bristol board cone to help you construct your choux tower, build it now. Line a shallow glass dish or baking tray with plastic wrap. In a bowl, mix together the cornstarch, flour, and 66g sugar. Whisk in the egg yolks and 144g whole milk. In a pot, combine the remaining 306g milk, 66g sugar, and the butter. We add half of the sugar to the milk because it prevents the milk from scalding! Slice open the vanilla beans and scrape out the seeds using the back of a knife. Add the seeds and pods to the milk mixture. Bring the milk to a boil over medium heat, stirring constantly. When boiling, remove from heat and remove the vanilla bean pods. Slowly pour the hot milk into the egg and flour mix, whisking the egg mixture constantly. Strain the mixture using a sieve and return to the pot. Continue to cook over medium heat, whisking constantly. It will take about 1-2 minutes for the mixture to begin to thicken. Once it begins to thicken, remove from heat and whisk constantly for 30 seconds until thick and uniform. Return one final time to medium heat and whisk for one minute to cook out the starch. Using a spatula, put the pastry cream into your prepared dish. Freeze for 15 minutes. Move the dish to the refrigerator for 1-2 hours, until cold. Weigh the flour and have it ready in a bowl. Return to heat and mix the dough now with a wooden spoon until a thin film appears at the bottom of the pot. If using a thermometer, heat the dough to approximately 170ºF (~2 minutes). This step removes moisture from the dough so that the choux buns are able to dry out enough in the oven. Transfer the dough to the bowl of a stand mixer and using the paddle attachment, mix the dough on medium speed until it cools down to 140ºF, or for about 2 minutes. Read all of step number 8 before continuing with the eggs!! Continue to add the eggs, one tablespoon at a time, until the dough is the right consistency. To test its consistency, dip your finger in water and run it through the choux dough. You should be able to create a well in the dough that doesn’t collapse. Continue adding egg until you achieve this consistency. Another consistency check is to lift the paddle of the stand mixer up out of the choux. The dough on the paddle should hang off in a V shape. You may not need all of the egg mixture. If you put too much egg, your dough will be runny and won’t hold its shape when piped. Go slowly here. Once the dough is ready, transfer it to a pastry bag fitted with a 3/8 inch round tip. If you don't have that size of piping tip, just make sure you pipe your choux into 1-inch rounds. 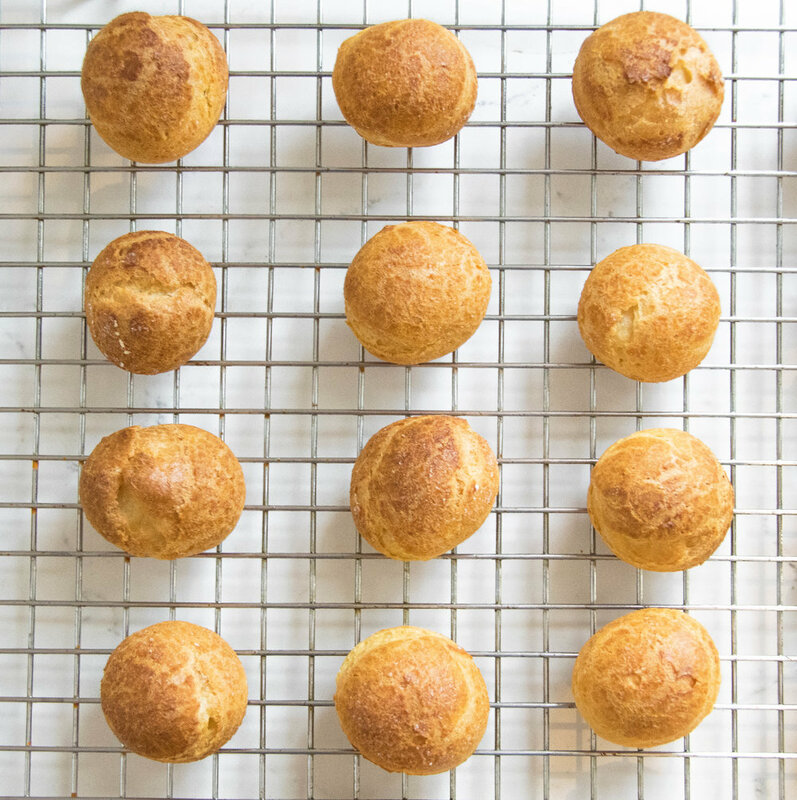 Pipe the choux buns into 1-inch diameter rounds, spacing the, 1 inch apart from each other. Dip your finger in water and pat the pointed tips of the pastry down. Generously dust the choux with icing sugar. This will encourage browning and is an easy alternative to egg wash.
Bake the choux buns for 10-12 minutes. Once the buns have risen, turn the oven temperature down to 325ºF and bake for 25-45 minutes, until golden brown. Place your pastry cream in a piping bag fitted with a 1mm round tip. Fill half of the choux buns by piercing the tops of the choux (the uneven upside) with your piping tip. Fill each choux just until the pastry cream starts to seep out (but not too much) and feels heavy. Fill the other half of your choux buns by piercing the bottoms (the even ends) of the choux with your piping tip. Repeat as above. Before you start the caramel (because assembly happens right when it's ready and you need to move quickly), make sure that everything you need is close to the stovetop. Gather the plate you will build your croquembouche on (+ Bristol board if using) as well as your choux buns, parchment paper, and decorations. Combine sugar, water, and corn syrup and cook over medium heat. Without stirring, bring to a boil. In the meantime, prepare a bowl of ice water big enough to dunk the caramel pot into when it's ready. This will stop the caramel from cooking any further and burning. The time it takes for the syrup to turn into caramel varies, but when it visibly starts changing from the clear sugar syrup to a light amber, keep a close eye on it. Things are happening. When the caramel is a medium amber colour, turn off the heat and dunk the pot in the cold water. Once boiling, decrease heat to medium-high and simmer until syrup changes to light amber in colour. At this point, the caramel will begin to change colour rapidly: keep an eye on it and remove from heat when dark amber in colour. Gather up all the choux buns that were pierced on top when filled with pastry cream and dip their bottoms into the caramel. Place on parchment paper to harden. The reason we're hanging around the stove is that the caramel will eventually get thick and harden. If it does, return it to low heat and continue building. Alternatively, you could keep it on low heat the entire time. Just watch it carefully to make sure it doesn't burn! Begin building the tower (omg). If you’re using a cone as a guide, start from the top and work your way down. If you’re like me and going rogue, start from the bottom. Use seven choux buns for the round base of your tower. You can add the choux that have been dipped in caramel in whichever way you like. It creates a nice visual effect when contrasted with the naked choux. To build the tower, dip the side of a choux into the caramel and adhere that to the cake plate. The idea is that the choux buns will be glued on their side so that you can see either their tops or their bottoms (for the dipped ones) when the croquembouche is finished. Add decorations to the tower now, using the caramel as glue. Once you’ve finished decorating, remove the caramel from the heat. Eventually it will thicken. Use this thickened caramel and a fork to wrap wisps of caramel around the tower. A croquembouche is best enjoyed the same day it is baked and assembled. It will still be delicious the following day but may lose some of the crispness from the caramel and the choux pastry. Cover with plastic wrap and store in the fridge for 1-2 days.